What an offseason for the Kings. From sending Rob Scuderi back to Pittsburgh to several players filing for arbitration to trading Jonathan Bernier to the Maple Leafs and much more, the Los Angeles hockey club has had no shortage of excitement over the last few weeks. The latest news continues to shock…sort of. Dustin “Pencakes” Penner’s future in Los Angeles has been uncertain since the Kings season came to an end, due largely in part to cap space and the Kings lack thereof. Penner is now gearing up for training camp, but he will be heading back to Anaheim, where he won his first Stanley Cup in 2007. He managed to make the move in the classiest of ways, reminding his fan bases in both SoCal locations that his heart is in both places. However, he was given the opportunity to return to the team that he first began his NHL career with, and the Kings weren’t going to be able to offer him much to keep him. It was the best choice he could have made for himself. Good luck in southern…Southern California, Dustin Penner. 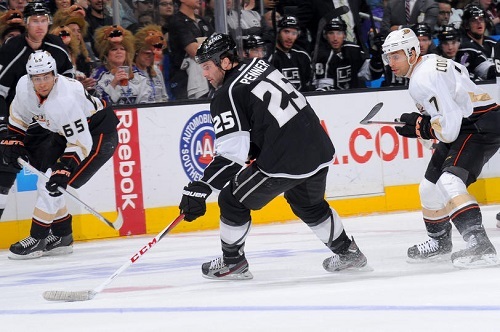 Dustin Penner skates for the Los Angeles Kings against the Anaheim Ducks. At the same time as Penner’s departure, the Kings welcomed Chicago’s left wing Daniel Carcillo, who used to play in Philadelphia with Jeff Carter and Mike Richards. Hopefully the Kings will be working on their power play – and Carcillo on his self-control, since Carcillo is most well-known for his Sean Avery-esque behavior and has racked up over a thousand penalty minutes in his career. The trade was made in exchange for a conditional 2015 draft pick. The makeup of the management has gone through changes as well. Ron Hextall, the Assistant General Manager for both the Kings and their AHL affiliate in Manchester, has packed his bags for Philly to fill the same role for the Flyers based on what he called a “gut feeling.” He has history with the Flyers, as a goalie and later as a scout, a role which was eventually followed by his promotion to Director of Professional Player Personnel. For his current duties, he will also serve as Philadelphia’s Director of Hockey Operations. GM Dean Lombardi made a move by hiring former Kings captain Rob Blake to be the new Assistant GM. Blake, who has won a Stanley Cup and a Norris Trophy, hung up his jersey in 2010 (as a Shark) and went on to work with the NHL Hockey Operations department and Brendan Shanahan the following year. The official announcement regarding Blake’s return to the Kings as a member of the management has not yet been made.